"You must be ready every day, all the time." Kino Lorber has released a new trailer for a re-release of a cult classic paranoia film titled The Atomic Cafe, which was first released in theaters in the US in 1982. The wacky, entertaining, frightening documentary film is a collage of footage and newsreels collected from the 1940s and 1950s of United States government issued propaganda films designed to reassure Americans that the atomic bomb was not a threat to their safety. It features all those classic, freaky clips of atomic bomb explosions, juxtaposed with the safety videos of how to survive, juxtaposed with all the propaganda videos explaining that all is well and we have the bomb and there's nothing to worry about. "Returning to theaters in a sparkling 4K digital restoration created by IndieCollect, The Atomic Cafe is an absurdist blast from the past that would be downright laughable if it weren’t so eerily relevant to our fake news present." Have fun. Description from Kino Lorber: Armageddon has never been so darkly funny as in The Atomic Cafe. This 1982 cult classic juxtaposes Cold War history, propaganda, music and culture, seamlessly crafted from government-produced educational and training films, newsreels and advertisements. Taken together, these sources cheerily instruct the public on how to live in the Atomic Age, how to survive a nuclear attack (!) … and how to fight and win a nuclear war. As a U.S. Army training film advises, "Viewed from a safe distance, the atomic bomb is one of the most beautiful sights ever seen by man." The Atomic Cafe is co-directed by filmmakers Kevin Rafferty, Jayne Loader, and Pierce Rafferty. It was first released in 1982 in America, and played again at the IDFA documentary festival in Amsterdam in 1995. 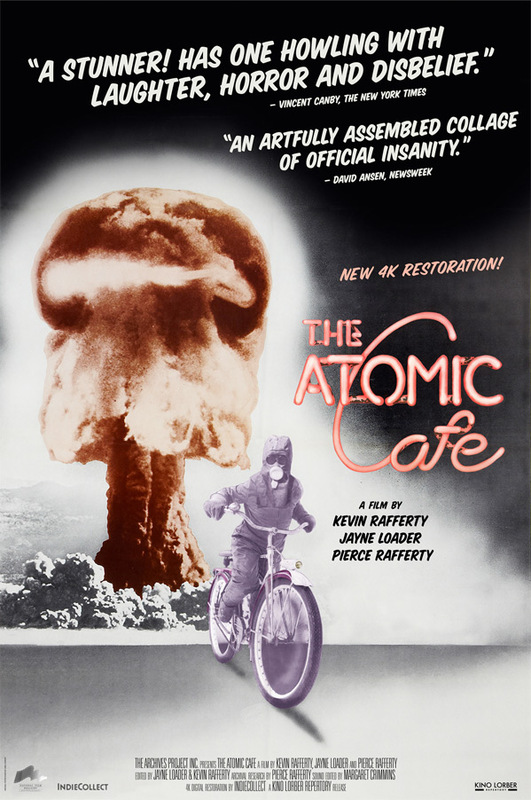 Kino Lorber will release the 4K restored version of The Atomic Cafe, created by IndieCollect, in select US theaters starting August and continuing through September into the fall. For more info & theater listings, visit their website.